Both Cymfony and BuzzMetrics (Nielsen Online) have recently described offerings aimed at monitoring the attention around adverts aired during the Super Bowl (the final championship game for US American Football teams). Cymfony's product seems to be presented with a little more information at this time compared with Nielsen's press release though the products seem pretty comparable. Nielsen makes a little more of the real time nature of their offering (the timeliness of report delivery, or database loading, will more and more become a key distinguishing feature in this market). The Nielsen offering also mentions orthogonal measurements delivered from surveys that they intend to carry out before and after the game. Carrying out social media analysis specifically around the advertising aired at the super bowl is, I suspect, more of a way to generate leads than it is to provide real in depth insights. Social media analysis does best (in general) when there is plenty of data and the amount of content that is generated discussing specific adverts is probably less than desirable for any real volumetric analysis. I'm not sure what this says, but it puts the Chicago Bears ahead of the Indianapolis Colts by some measure. 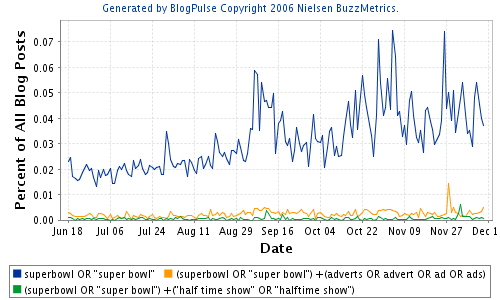 The Superbowl, which finished just a few minutes ago, provides a great example of real time blog monitoring, as exemplified by BlogPulse's new BlogPulse Live feature. 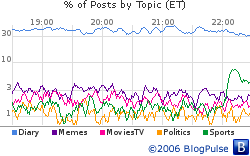 In the graph below, the line for Sports, which - like all the lines in the trend chart - shows the percentage of posts for the topic, has a clear rise after 10 - as the results were becoming clear. Looking at the trending of the names of the two Super Bowl teams shows mentions of the Pittsburgh Steelers ahead of the Seattle Seahawks. This is an interesting example of bias in terms and the effect on search. The identity of a sports team is a mixture of the name (steelers/seahawks) and the cities that host them (pittsburgh/seattle). The mixtures are different for each team - here the hypothesis is that the name of the team is slightly more weighty for the Steelers than for the Seahawks. 12, 248 posts mentioning the Pittsburgh team include the word 'win', compared with 6, 955 for the Seahawks. Taking the ratio with the totals for each team (47, 837 versus 24, 709) we get: 25.6 % versus 28.2 %. 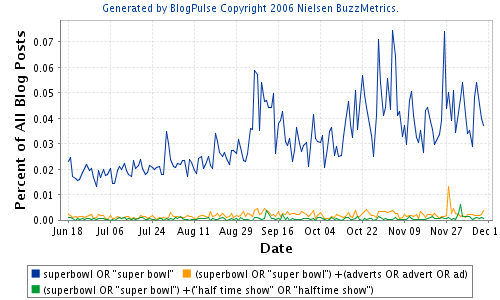 In other words, a post mentioning the Seahawks is more likely to mention the word 'win' than for the Steelers. For 'lose' the percentages are 8.9 % and 8.8 %. I have no idea what these numbers mean, but thought I'd put them out there anyway.